(ENGLISH) John the Baptist & Martin Luther King Jr.
(Armenian) John the Baptist & Martin Luther King Jr.
Sermon delivered on Sunday, September 30, 2007 at St. Peter Armenian Church Youth Ministries' Center on the occasion of Varaka Khatch and 25th Anniversary of Ordination. English follows the Armenian language message. The 30th was the Feast of the Holy Cross of Varak. This feast is always celebrated two weeks after the Feast of the Exaltation of the Cross. This sermon is based on the Gospel reading for today (10-21-07). It comes to us from the Gospel of Luke 4:17-21, where it is written: 17The scroll of the prophet Isaiah was handed to him. Unrolling it, he found the place where it is written: 18"The Spirit of the Lord is on me, because he has anointed me to preach good news to the poor. He has sent me to proclaim freedom for the prisoners and recovery of sight for the blind, to release the oppressed, 19to proclaim the year of the Lord's favor." 20Then he rolled up the scroll, gave it back to the attendant and sat down. The eyes of everyone in the synagogue were fastened on him, 21and he began by saying to them, "Today this scripture is fulfilled in your hearing." 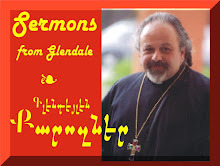 Sermon delivered at St. Peter Armenian Church and Youth Ministries' Center, Glendale on the occasion of the Nativity and Baptism of Jesus Christ.